When it’s hot in the kitchen, the last thing you want to do is cook! 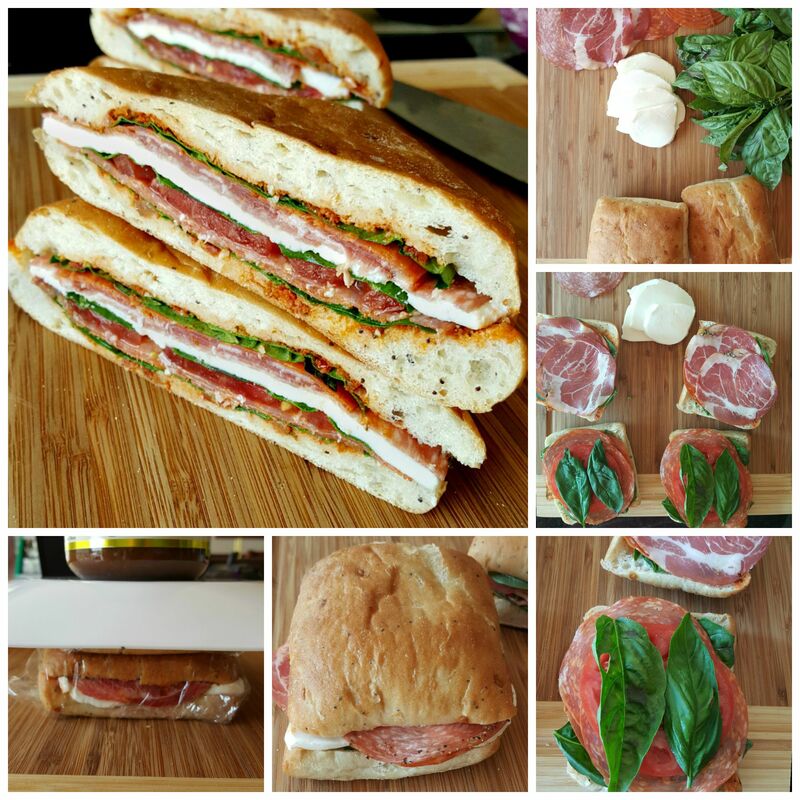 Italian Pressed Sandwich makes for a delicious no cook weekday supper! Then kick back with some iced tea while they press. It’s the dog days of summer! Can you feel it? At least in the Northern hemisphere, right? I think that’s right. I barely passed geography because mine was all about history. Don’t ask. So, we have the in laws in town. They’re from Florida so you’d think they’d be used to the heat, but I gotta tell ya; no one can get used to the humidity in Washington, DC!! Those that know, I can see ya shaking your heads. It’s meltingly hot. It can take a 90 F day and turn it easily into a 100+ heat index day. You step outside and just melt. There’s really no other way to describe it. When it’s that hot outside, the last thing you want to do is cook. Anything. At all. You don’t even really want to be in the kitchen. When it’s that hot you don’t even want to grill anything. When it’s that hot, you don’t want to be near anything that may emit any kind of heat; lightbulbs, people, animals, hair dryers. You get my point. 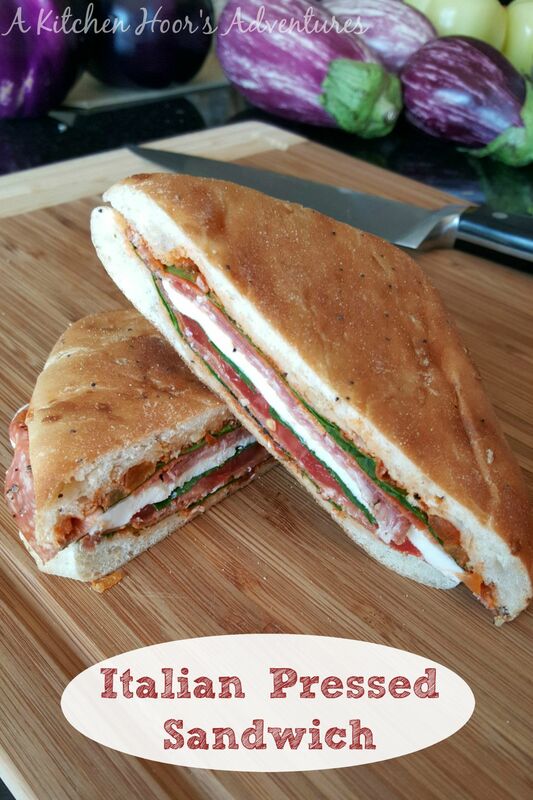 Enter the Italian Pressed Sandwich. This baby is delicious, simple, and generates no heat what so ever. Well, unless you opt for some spicy options in the meat department. But that’s a good kind of heat in my book. Just pick some of your fave Italian meats. I opted for some capicola, calabrese, and sandwich pepperoni; which are all a little spicy. But the cool mozzarella, fresh tomato and delicious pesto all counter that spiciness. I used a tomato pesto, but switch it up and use a basil, or a kale, or even a spinach! Grab provolone instead of mozz or a gouda. You really can cater this sandwich to your likings. The only requirement is to give this sandwich time to set. It really does need to press; allow all the ingredients to meld and marry and become amazing. Nope. Does it look soggy? The tomato is sandwiched in between the meat layers, so it doesn’t really get the bread soggy at all. The soggy factor is built into the pesto. If it’s pretty moist, then you might want to watch the bread and make sure it’s not mush. Mine wasn’t too wet, so it was perfect after about 15 – 20 minutes. And when I say perfect, I mean perfect! The bread had absorb the exact amount of the pesto flavor. The meats were all melded together. The mozzarella had soaked up some of the basil flavor. That’s what I mean when I say it’s required that you give this time to marry. Now, here’s how the conversation went in our house. When it's hot in the kitchen, the last thing you want to do is cook! 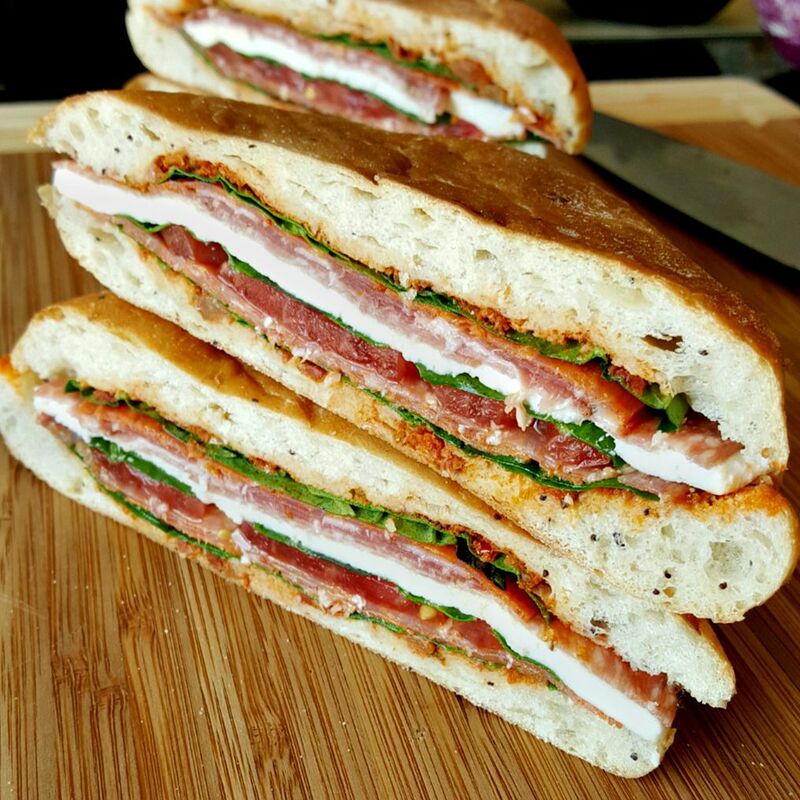 Whip up some delicious Italian Pressed Sandwiches then kick back with some iced tea while they press; allowing the flavors to meld. 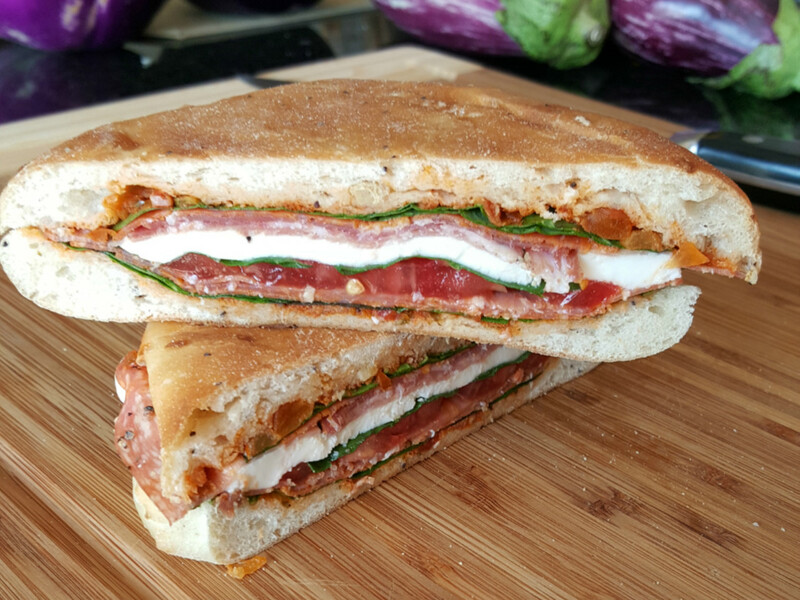 Spread one tablespoon of tomato pesto on each half of the ciabatta bread. Place one ounce of sandwich pepperoni and capicola on each of the buns. Then layer the mozzarella, basil, and tomato. Continue layering the remaining meats. Place the top of the bun on the sandwich and tightly wrap in plastic wrap. Place a plate on top and weigh the sandwiches down with a large can, a skillet, or other heavy object; allowing the meats to meld with the cheese, basil, tomato, and the bread. Press the sandwiches for at least 15 minutes before serving with some cool, iced tea, and chips. Thank you! Yes, I know you’re always busy. 🙂 This recipe is perfect for the fam! Thank you! I find most of these can be purchased in the grocery at the deli counter. At least in ours you can. It is worth it if you can find the meat. So Good!